Not many of us have heard of a Systematic withdrawal plan in a mutual fund. But it certainly is as useful as any normal mutual fund investment type. Today, we will look into all you need to know about Systematic Withdrawal Plan (SWP). Systematic Withdrawal Plans are mutual fund variants which are the exact opposite of Systematic Investment Plans i.e. while in SIPs investors keep putting in small portions of their money at regular intervals in the mutual fund scheme and allow it to accumulate and grow over time, SWPs let investors to withdraw small lots of their lump sum money invested in a scheme at regular intervals over a period of time. (read more about Systematic Investment plans here). Again, SWP can be done at once or in a phased manner through an STP i.e. a Systematic Transfer Plan, by which an investor can shift his SIP/ lump sum investment to an SWP or move from an equity based scheme to a debt or shift between funds in any order, mostly, that are handled by the same AMC . SWPs are generally opted by retirees or anyone who has an irregular or no income, but has a lump sum of money and wants a regular flow of portions of the lump sum money like a salary and so are mostly debt oriented schemes. In an SWP the investor gets to select the amount he wishes to receive every month and/or the number of years he wants his money to keep filling his pocket with frequent money withdrawals. What happens is that the amount put in an SWP scheme buys an investor certain units and on every withdrawal, few units whose worth equals the amount of money he needs are sold and paid to him and the rest of the investment is allowed to grow according to the rate of return of the Mutual Fund scheme and lump sum of money reduces by the withdrawal amount and this goes on till the entire amount is exhausted. So, to summarize, two things are happening simultaneously in an SWP. One, the total investment made is eroding after every such regular withdrawal of money and two, the remaining money is left to grow till the next withdrawal happens and so on and so forth till the value of the investment becomes nil or the investor wants to withdraw the remaining lump sum at once. Let's say that Mrs. Margaret, 56, received a lump sum of $60,000 on her retirement from her employer and chooses Blackrock’s Systematic Withdrawal Plan stating that she has $60,000 and needs $400 a month and that she expects to live for the next 20 years. So, $60,000 at the rate of $4,800 a year can fund her for ($60,000/$4800) 12.5 years. So she would need her remaining money to grow while she is withdrawing at regular intervals. Further, assuming that the scheme has an average of 8% p.a. returns and the tax rate is 30% p.a. So the net returns would be 5.6% p.a. With a return of 5.6% p.a., Margaret’s $60,000 would fill her pocket with $4800 p.a. for 22 years. If with some tax savings she is getting net returns of around 7% p.a. she would be receiving her $4800 p.a. for 30 years. 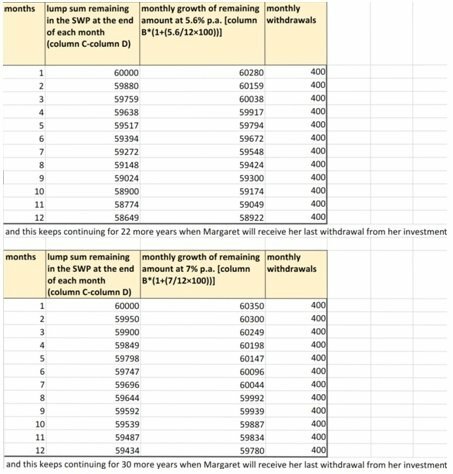 Let me show you an MS Excel working of what happens for 1 year (12 months) so that u can imagine what happens throughout 22 years with 5.6% returns p.a. and 30 years period with 7% returns p.a.